Stop Use Indications: Stop use and ask a doctor if cough lasts more than 7 days, comes back, or is accompanied by fever, rash, or persistent headache. These could be signs of a serious condition. WARNINGS. DO NOT USE. ■ to sedate a child or to make a child sleepy. ■ if you are now taking a prescription monoamine oxidase inhibitor (MAOI) (certain drugs for depression, psychiatric, or emotional conditions, or Parkinson's disease), or for 2 weeks after stopping the MAOI drug. If you do not know if your prescription drug contains an MAOI, ask a doctor or pharmacist before taking this product. ASK A DOCTOR BEFORE USE IF YOU HAVE. ■ trouble urinating due to an enlarged prostate gland. ■ glaucoma. ■ a cough that occurs with too much phlegm (mucus). ■ a breathing problem or chronic cough that lasts or as occurs with smoking, asthma, chronic bronchitis or emphysema. ASK A DOCTOR OR PHARMACIST BEFORE USE IF YOU ARE taking sedatives or tranquilizers. WHEN USING THIS PRODUCT. ■ DO NOT USE MORE THAN DIRECTED. ■ marked drowsiness may occur. ■ avoid alcoholic drinks. ■ alcohol, sedatives, and tranquilizers may increase drowsiness. ■ be careful when driving a motor vehicle or operating machinery. ■ excitability may occur, especially in children. IF PREGNANT OR BREAST-FEEDING, ask a health professional before use. KEEP OUT OF REACH OF CHILDREN. In case of overdose, get medical help or contact a Poison Control Center right away. PACKAGED WITH TAMPER-EVIDENT BOTTLE CAP. DO NOT USE IF BREAKABLE RING IS SEPARATED OR MISSING. Inactive Ingredients: Inactive IngredientsAnhydrous Citric Acid, Artificial & Natural Flavors, FD&C Red No. 40, Glycerin, Lactic Acid, Propylene Glycol, Purified Water, Sodium Benzoate, Sodium Citrate, Sorbitol Solution, Sucralose. 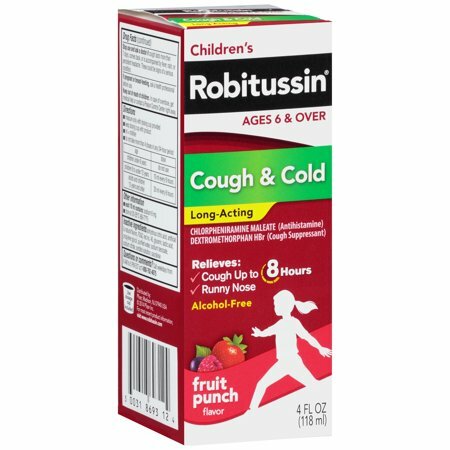 Ingredients: Active: Chlorpheniramine Maleate, Usp 1 Mg (Antihistamine), Dextromethorphan Hbr, Usp 7.5 Mg (Cough Suppressant). Inactive: Anhydrous Citric Acid, Artificial & Natural Flavors, Fd&C Red No. 40, Glycerin, Lactic Acid, Propylene Glycol, Purified Water, Sodium Benzoate, Sodium Citrate, Sorbitol Solution, Sucralose. Instructions: Use dosage cup included. Directions measure only with dosing cup provided keep dosing cup with product mL = milliliter do not take more than 4 doses in any 24-hour periodFor children under 6 years, do not use.For children 6 to under 12 years, take 10mL every 6 hours.For adults and children 12 years and over, take 20mL every 6 hours.